Tis the season for crackling fires, snowball fights, and warm and delicious hot chocolate. But, how do you make yours? Do you rip open a package and pour hot water over something that claims to be hot chocolate? Do you splurge at your favorite coffee shop for a “special” hot chocolate drink? 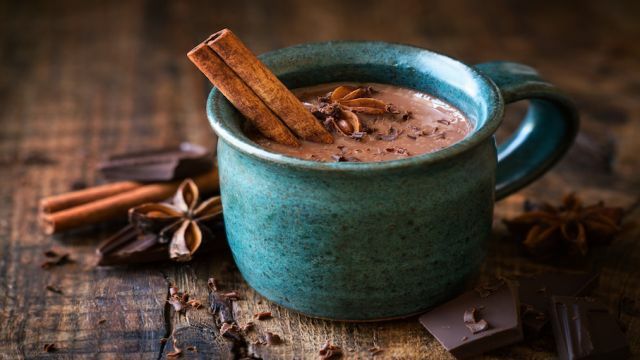 What if I told you that there was a hot chocolate delight teaming with health benefits that far surpasses any other hot chocolate you have ever had before in flavor, richness and all around goodness. The superpowers of the ingredients of this creamy and delicious hot chocolate are what make this drink so incredibly nutritious and delicious. Who doesn’t love dark chocolate? Research shows that dark chocolate can decrease stress and inflammation while boosting immunity and improving your mood and memory. Want protection from damaging ultraviolet rays? Science says, eat more dark chocolate. Cacao beans contain eight times the number of antioxidants found in strawberries. These antioxidants protect skin and combat free radicals that contribute to signs of aging. The fats that raw cacao contains also support well-being. They include oleic acid, a monounsaturated fat that is also found in olive and coconut oils. They also include saturated fats, which the body needs to function properly. Minerals in cacao also contribute to the health of the cardiovascular system. One study, published by Science Daily found that eating 6.7 grams of chocolate per day had a protective effect on heart health. This superstar spice is gaining quite a following in the alternative health community and beyond. Researchers from all over the world have studied this ancient Indian spice for it’s powerful, seemingly endless list of beneficial properties. In fact, turmeric has been featured in more than 5,600 studies to date, with new findings coming out regularly. Among its many benefits, turmeric is best known for its ability to treat chronic inflammation, something we all deal with from time to time. The active compound it contains — curcumin — has powerful anti-inflammatory properties similar to over-the-counter medications. Wow! Scientists are finding an astonishing array of antioxidant, anticancer, antiviral, antibiotic, antifungal and antibacterial properties. As an immune system booster, turmeric is five to eight times stronger than vitamin C and E.
Studies show that curcumin, the principal curcuminoid of turmeric, inserts itself into cell membranes where it does a little housecleaning and reorganizing, adding vibrancy to the cell itself. Suddenly a disorganized cell becomes organized, allowing information to flow through it so it can function more effectively. The result of this action increases the cell’s resistance to infection, malignancy and more! Coconut oil has certainly earned its superfood designation. What the people of the tropics have known for so very long is finally becoming evident to the masses. Loaded with therapeutic properties, this is one saturated fat you want to include in your diet. Research shows that the antioxidants in coconut oil can reduce inflammation and effectively treat arthritis. According to research, 50% of fats found in coconut oil are MCTs such as lauric acid that is easily absorbed by the intestine and can be used by the body to make energy. Coconut oil contains two anti-viral properties, lauric acid, and caprylic acid. Both of these compounds are known for their ability to fight candida overgrowth and bacterial infections. Coconut oil has been found to prevent a number of viruses and pathogens including influenza, herpes, helicobacter pylori, and dangerous protozoa such as giardia lamblia. Coconut oil contains medium chain fats that have a thermogenic effectwhich allows them to increase fat burning when compared to the same calories found in other fats. One study found that eating just 1 to 2 tablespoons of medium chain fats per day increased energy expenditure by 5% or 120 calories per day. Additional research confirms that when humans replace the fats they are consuming with medium chain fats they burn more calories. This hot chocolate drink contains Ceylon cinnamon, a delicious and health-promoting spice. Ceylon cinnamon is loaded with phenolic compounds, flavonoids, and antioxidants. This is what makes this spice one of the most beneficial spices on earth, with powerful antioxidant, anti-diabetic, anti-microbial, anti-inflammatory, and immune-boosting powers. Here is the best dark chocolate recipe on the planet, hand’s down. Your whole family will be asking for seconds. Finally, a hot chocolate you can feel good about drinking. Warm the coconut milk until it is just lightly simmering. Add cocoa, turmeric, ginger, cinnamon, pepper, honey, and coconut oil. Top with real heavy whipping cream and sprinkle with more cinnamon and grated dark chocolate. Enjoy this amazingly delicious and healthy treat! Article Shared from the Alternative Daily.